One of our favorite films from Fantastic Fest 2013 was E.L. Katz's Cheap Thrills (Jeremy's review). The film is visceral, hilarious and painfully dark at times, but boy do we love it. In Austin last year we had the chance to sit down with director Evan "E.L." Katz and star Pat Healy along with guests Ethan Embry and David Koechner to chat about what makes Cheap Thrills such a special little flick. We went over some of the themes of the film with Evan, talked through the process of building suspense while maintaining tone, and got into the grit of the relationships. Listen to the full-on 30-minute TGB interview from Fantastic Fest. The talk gets a teeny bit spoilery when it comes to the plot so tread lightly if you have yet to see the film - it's now available on VOD. This is definitely worth checking out for some great insight into what goes into creating a truly captivating little thriller that will be remembered for some time. Watch Cheap Thrills now. 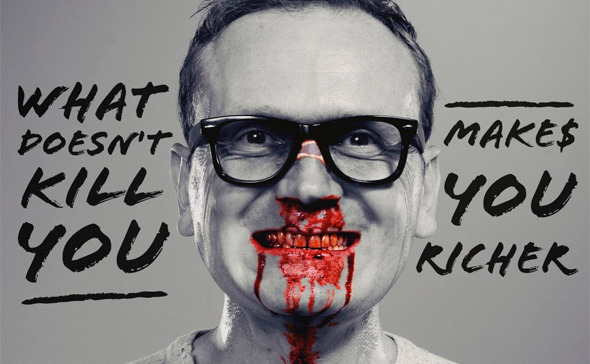 Cheap Thrills is the directorial debut from E.L. Katz and stars Pat Healy (seen in Compliance) as a recently fired father facing eviction who agrees to take on an escalating series of insane challenges in exchange for cash payments from a rich couple with a twisted sense of humor. The film also stars David Koechner, Sara Paxton, Ethan Embry and was penned by Trent Haaga (Deadgirl) and David Chirchirillo. It first premiered at last year's SXSW Film Festival in the Midnighters category, and was eventually picked up by Drafthouse Films out of Austin, TX. E.L. Katz's Cheap Thrills will be released on VOD on February 21st and in limited theaters starting March 21st soon after. For more on Cheap Thrills, visit Drafthouse Films. Hip-Hip-Hooray! It's (Bonus) Golden Briefcase Day! Thanks fellas.